Linda Eisner is the creator of GraffEtch. GraffEtch was created to combine graffiti and barber etching. GraffEtch is specifically designed for tagging, tracing and filling in barber etchings with bold bright color. It’s the "proper tool" to color-in barber designs. Hair art patterns are etched onto the scalp with a trimmer, fine details can be created with a razor. 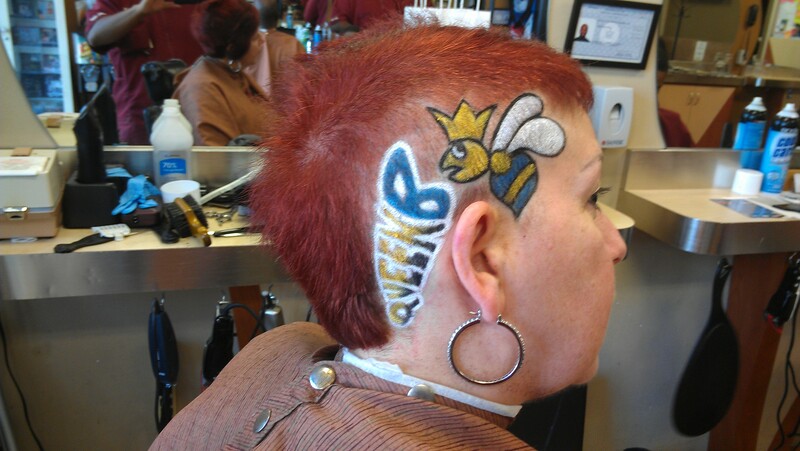 Create sport insignias, geometric shapes, cartoon characters & even famous faces in hair art. GraffEtch is then used to enhance the art with these special color pencils. They are not ordinary eyeliner pencils. GraffEtch is specially formulated to be creamy & blend able. Apply on a newly shaved tender scalp, the face, body and on short hair. Color is waterproof, sweat proof, yet removes easily with shampoo. It won’t drip down if you sweat. Graff*Etch pencils have the proper combination of texture, long lasting wear and ease of application. Plus, there are built-in sharpeners and a poster in every 8 color box. GraffEtch is Free of Paraben, Petroleum & Gluten. GraffEtch is the first choice among barbers and stylists that do hair art. Designs pop when color is added. GraffEtch is growing as fast as tattoos. The color washes out and the hair grows back. It’s a temporary way to express yourself. #graffetch & show us your art.